Lying around daydreaming about movies the other day (as I tend to do), I began to think about The King and I, a movie I last saw at the Maureen O’Hara Classic Film Festival last month, and just how much I love one particular sequence in the movie. In a film that I think is chock full of quality numbers, the scene in which the servants of the king stage a Siamese version of Uncle Tom’s Cabin may be one of the most beautiful scenes ever put on film. Its use of traditional Siamese (Thai) garments, music, and dance to tell the classic story of slaves in the American Civil War is not only a clever idea within the context of the movie, but is also immensely symbolic and serves to highlight recurring themes in both stories about tolerance, equality, and freedom. The King and Anna start out friendly, then around the 3:00 mark, it starts to border on romance. By 4:10, all bets are off. It is no surprise, then, that Rodgers and Hammerstein would choose to incorporate Uncle Tom’s Cabin, the controversial anti-slavery book by Harriet Beecher Stowe, into this play. The book is viewed as crucial in shifting views of slavery in the American South, and likewise in the play, the production of the Uncle Tom’s Cabin ballet threatens the power of the king, ultimately diminishing his power against the slave Tuptim. The symbolism of this number is far-reaching and multi-layered. The relationship to the slavery embedded in the story of The King and I is evident, and its relation to the overarching social awareness of Rodgers and Hammerstein has already been addressed. But I think it is fitting that the movie was made in the era that it was. In 1956, segregation had just been outlawed, and anger was rampant throughout the country. This scene shows tolerance and love on a global scale, as though Rodgers and Hammerstein were speaking directly to the American public and telling them us all that we should learn a lesson from what we’re seeing. 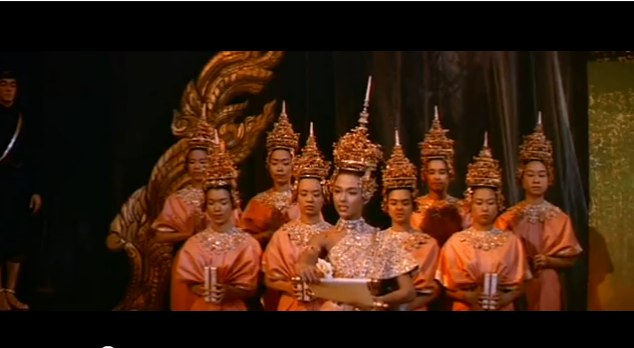 “The King and I” is one of my very favorite movie musicals. The “Uncle Tom’s Cabin” sequence has always stood out for me. There is a profound message involved, of course, yet the scene is so artfully staged that one doesn’t feel at all as if they’ve been lectured…just simply and gently reminded (or enlightened). You always make the most insightful comments. Thanks for your lovely message, I agree with you on all counts. I think it’s one of the most beautiful ballet sequences on film. I’m very late in finding your article, but I was prompted by seeing the film only last night with my kid. I had only the vaguest memory of it from my own childhood, and no memory of this exquisite sequence at all. In the decades since I actually became a dancer. So I’m prompted to ask who’s creation it is. Of course, the great Jerome Robbins is credited at the beginning as being responsible for the “dances”, but this falls short of including this central ballet. The precision and authenticity of the staging made me believe that the troupe is authentic (classical Asian trained) as the training looks very specialized. No doubt good (Western) classical dancers under the iron hand of Robbins could have come up with something like this, but it made me curious. Appreciate any further information you might know, and thanks for a great blog. Thanks for your great question and your nice words about my blog. Isn’t it a beautiful sequence? Jerome Robbins did indeed choreograph it, but he consulted with Michiko Iseri to confirm the appropriate Asian influence in his choreography. The dancers, according to IMDB, were Kanna Ishu, Misaye Kawasumi, Shirley Nishimura, Valentina Ousmanski, Alice Uchida, and Marion Jim (Simon). A quick google search shows Valentina Ousmanski still alive and running a dance studio in Los Angeles, but I can’t find info on the others…the Japanese names of many of them lead me to believe that the dancers probably did have some previous Asian dance training and Robbins specifically searched for that. And now that I think about it, Robbins’ perfectionism wouldn’t settle for anything less! Thanks again for your nice words, and please feel free to ask any further questions or make any further comments! I love interacting with my readers.